Tertullian was born of heathen parents in Carthage, Africa. He studied law and lived an exceedingly sinful life until he received the Lord Jesus Christ at the age of thirty. He became an intense, hard-hitting defender of the fundamentals of the Christian faith against the traditions of Romanism. 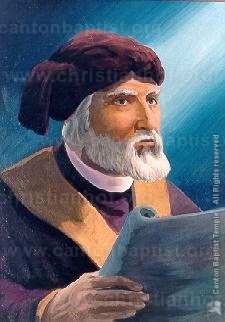 He joined the Montanists, a group of pre-millenial, Bible believing Christians and spent the rest of his life writing and preaching primitive Christianity as opposed to Romanism with its ecclesiastical traditions and ceremonies contrary to the scriptures.